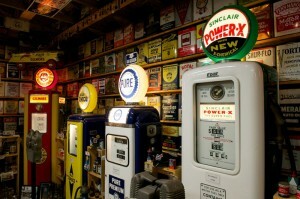 Stepping into Rick Trego’s 24’ x 44’ garage is truly a step back in time. Surrounding Akron Children’s security officer’s sparkling 1978 Chevy Nova are 20 old-time gas pumps and 1,000 2-gallon oil cans – all meticulously restored. The seeds for his hobby were likely planted when he rode with his grandfather to fill underground storage tanks at local gas stations.